The Amazon HQ2 selection has been nothing if not exciting to watch. Like a battle royal wrestling match, we waited with bated breath, as 238 cities were gradually disqualified to leave just one standing. Which made it all the more shocking when Amazon announced that two cities would share the title of HQ2: Crystal City, VA, in the Greater Washington D.C. area and Long Island City, Queens, in the Greater New York City area. A major factor in this decision was available talent. Hiring 50,000 qualified employees is no small feat, and splitting the HQ2 title between two cities provides an even larger talent pool for sourcing. 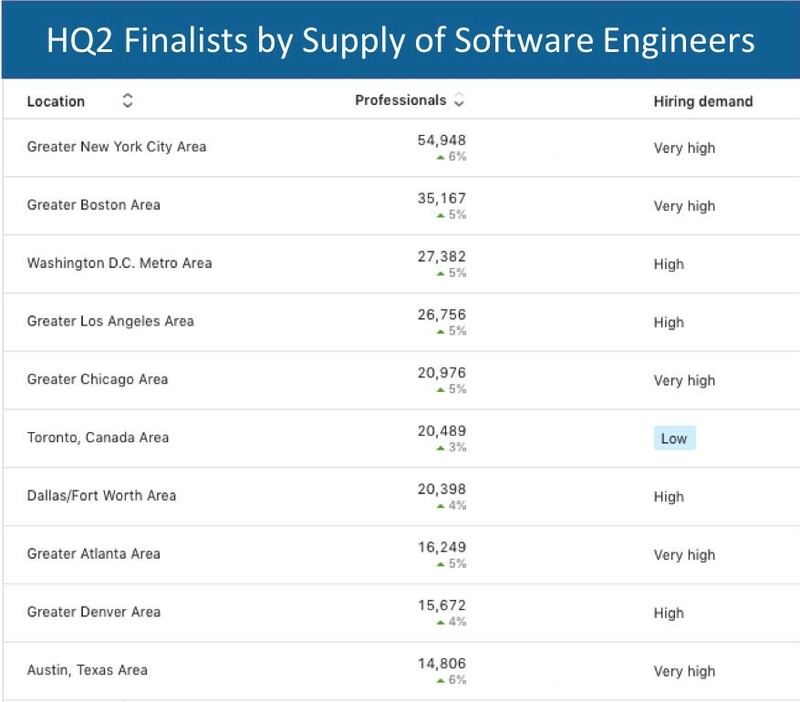 We looked at the supply of software engineers in all of Amazon’s top 20 finalists for HQ2 and found that both of the winners have plenty of software engineers to go around. 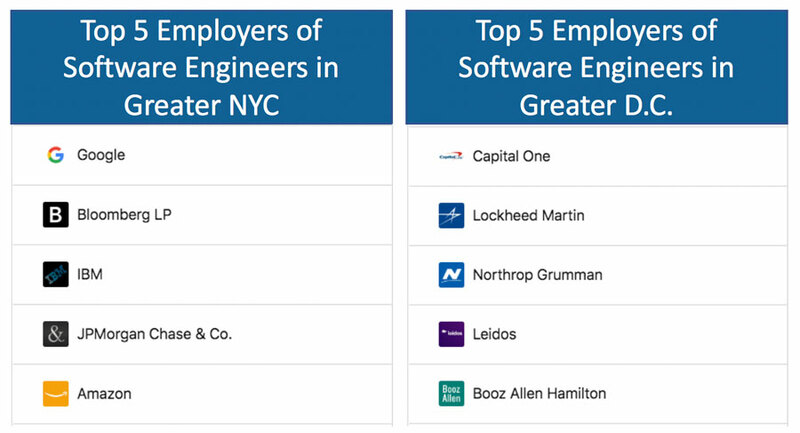 The greater New York city area has the largest supply of software engineers—well over 50,000—while the Washington D.C. area has the third largest supply (over 27,000) behind Boston. With this much talent on tap, Amazon should have its pick of the very best. But sheer volume of software engineers only gives us one perspective. Talent pool growth is another important factor to consider when choosing a new office location. Fortunately, the growth rate of software engineers in each market is on par or above the average for all of North America, which is +5%. That means Amazon will enjoy a consistent supply of new talent moving to those regions and entering the workforce—and growth might even increase as a result of this announcement. That increased competition could be due to the presence of other large tech companies in NYC like Google and IBM—both top five employers in the region. As you might expect, defense and space companies are bigger in the D.C. area, with Lockheed Martin and Northrop Grumman being two of the top five employers of software engineers. One thing to consider when opening up a new office location is which industries are employing the talent you need. 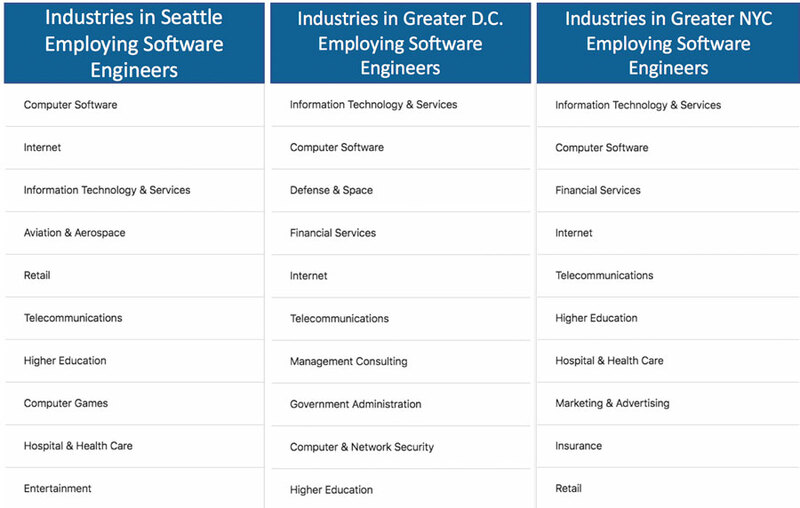 The top industries for software engineers in D.C. and NYC are interesting in the way they complement the top industries in Seattle, Washington, home of Amazon’s first headquarters. Most notably, D.C. has a lot of software engineering talent with defense experience, as defense and space is the third-largest industry employing this talent. This move makes sense for Amazon, who is favored to win the $10B “JEDI” contract from the Pentagon. For the Greater New York City area, marketing and advertising and financial services are two key industries currently employing software engineers and neither of the two have a presence in Seattle. Why does this matter? If Amazon is looking to diversify its offerings and expand into new verticals—which they are likely to do—they’ll need talent with not only functional expertise, but industry knowledge as well. Choosing a new office location is never easy—especially when your office is the size of a small city. But the right data and insights can remove a lot of the guesswork. One thing is for sure: Amazon HQ2 won’t be short on software engineering talent anytime soon. 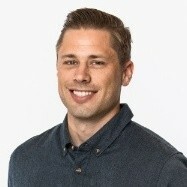 The analysis above was produced using LinkedIn Talent Insights in November 2018. The talent pool was defined using the “title” filter by “Software Engineer” in the Talent Pool report. Talent Insights groups related standardized job titles in results, including such titles as “Staff Software Engineer.” Any related member-input titles such as SWE, Software Eng., or Software Developer also roll into the standardized job title “Software Engineer” included in this analysis. In this post, we use Greater New York City Area as an approximation for both New York City and Newark, New Jersey, and the Washington D.C. Metro Area as an approximation for Northern Virginia, Montgomery County, and Washington D.C. LinkedIn determines members’ locations based on the cities, regions or countries that members list in their LinkedIn profiles.